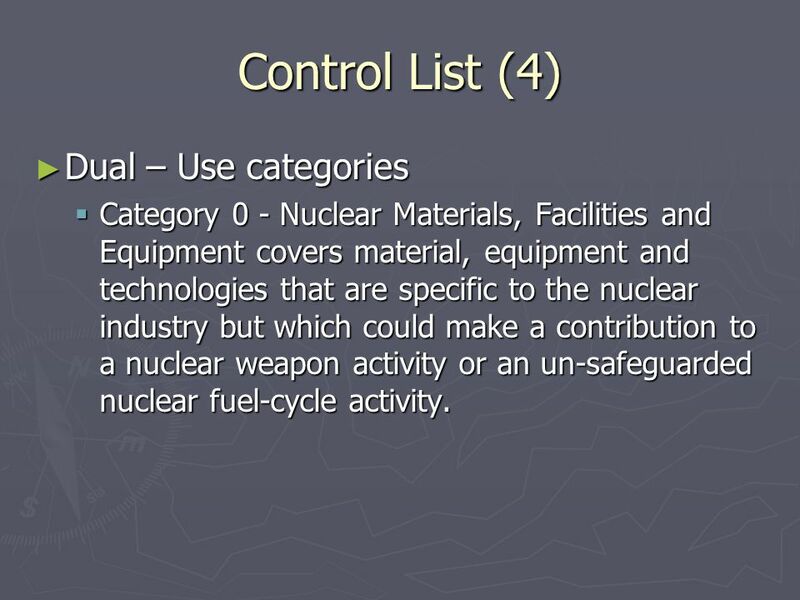 Category 0 - Nuclear Materials, Facilities and Equipment covers material, equipment and technologies that are specific to the nuclear industry but which could make a contribution to a nuclear weapon activity or an un-safeguarded nuclear fuel-cycle activity. 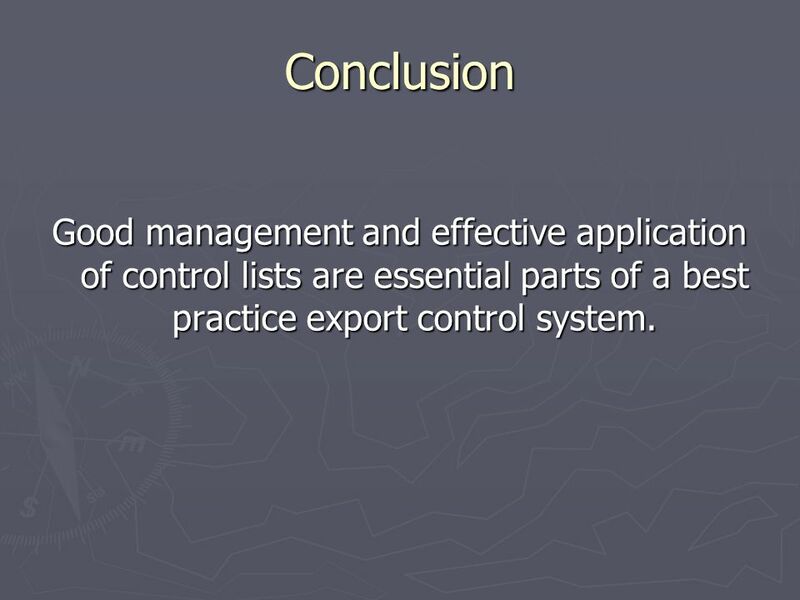 12 Conclusion Good management and effective application of control lists are essential parts of a best practice export control system. 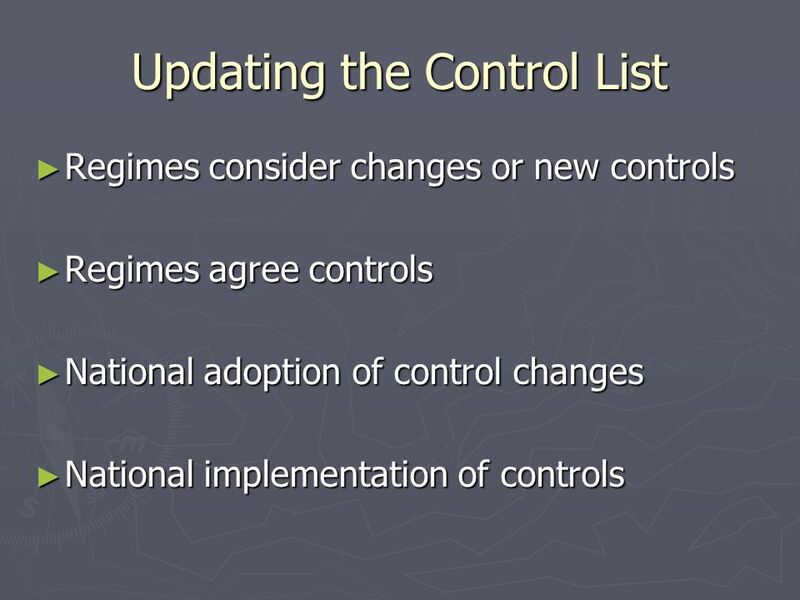 Download ppt "HOW TO ADMINISTER CONTROL LISTS"
US-India Civil Nuclear Relations ITRN 603 International Trade Relations Kristin Isabelli Slide 1. 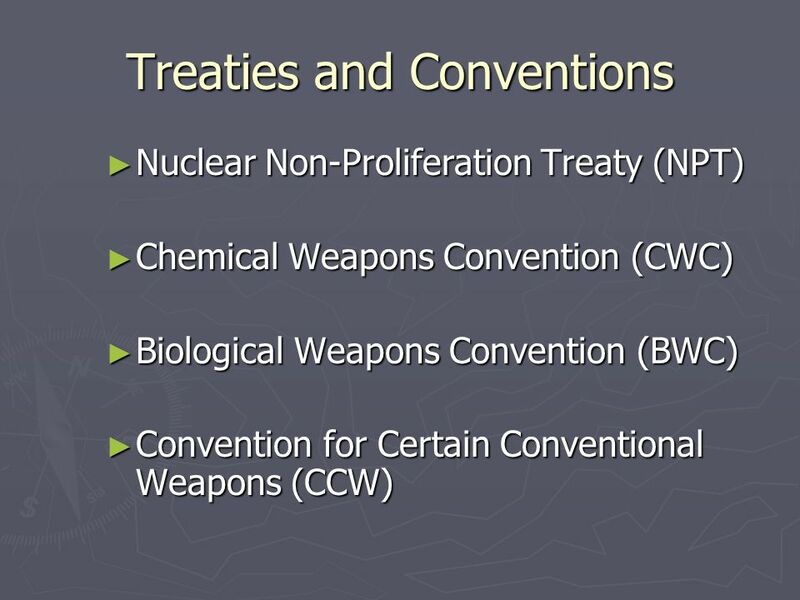 Implications of the NPT on a Coordinated Approach to Triple S Dr M. S. Draper C.B.E. 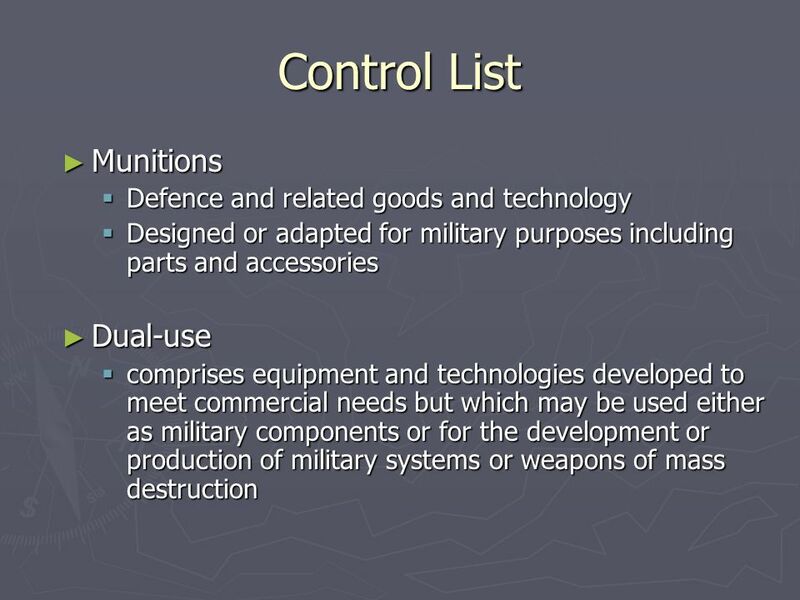 Past head – Non-Proliferation Policy UK Department of Energy and Climate. ROLE OF PERMIT OFFICERS AND END-USE ASSURANCES A CANADIAN PERSPECTIVE. 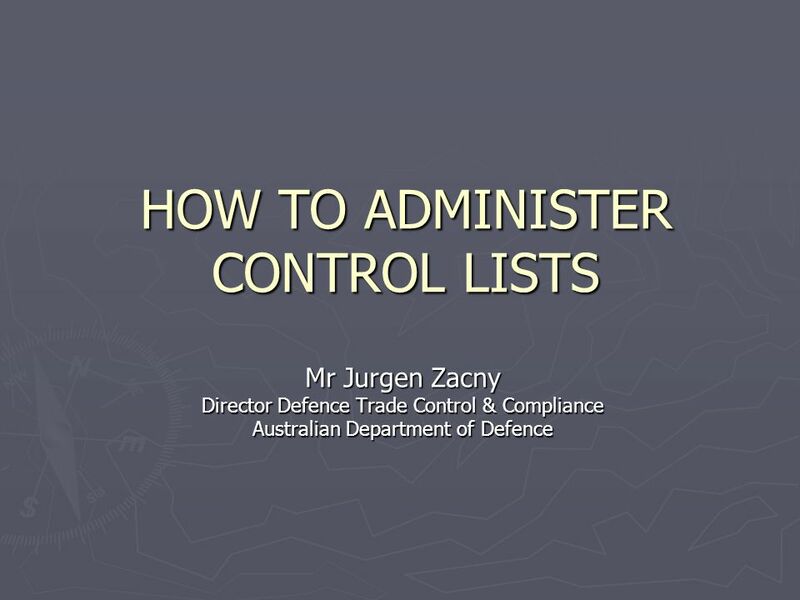 1 of 4 Elements of the Treaty Establishes an ITAR-free environment for the US Government, Australian Government and accredited US and Australian companies. U.S.-India Dual-Use Export Policies and Procedures November 2004. 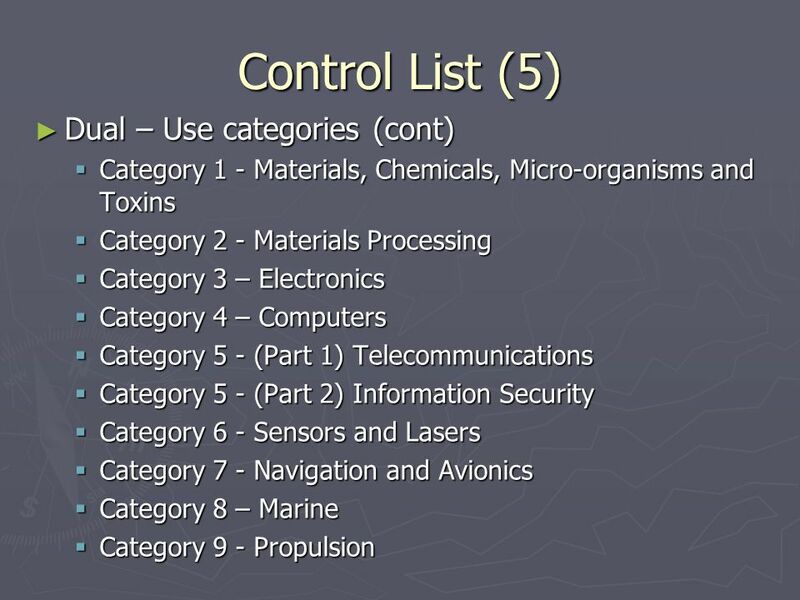 Export Control Overview John R. Murphy Business Development Manager Sartomer Company October 4, 2004 Boston, MA. 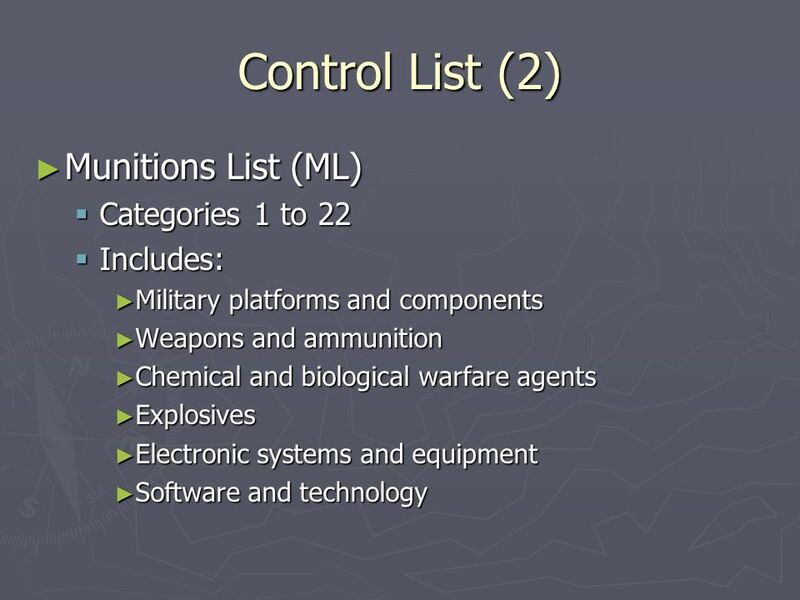 In April 2004, the UN Security Council adopted United Nations Security Council Resolution 1540, establishing for the first time binding obligations on. 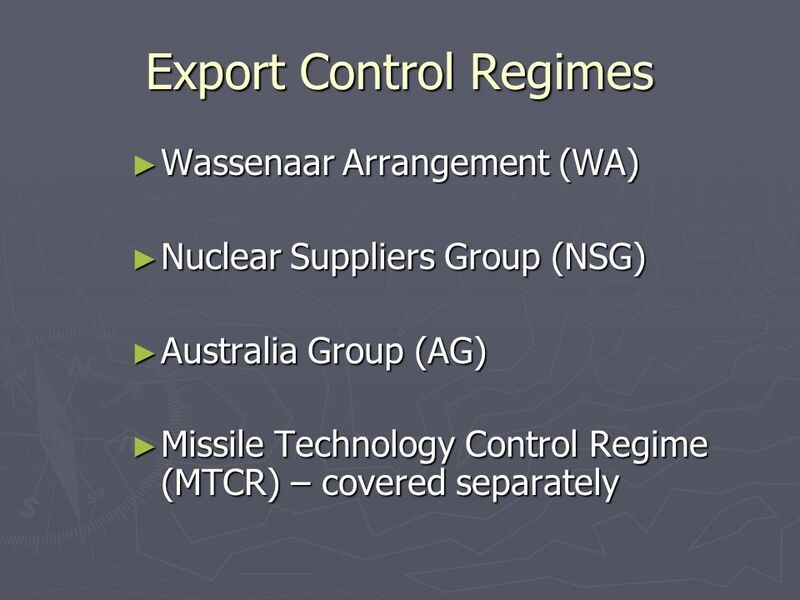 The Regulation of International Trade in Enriched Uranium in a New Build Era Maxine Symington. EXPORT ADMINISTRATION REGULATIONS (EAR) Research and Economic Development MAY 28, 2013 John Jacobs. Oslo, 4 March 2005Managing Nuclear Material Stockpiles in the 21 st Century 1 Nuclear Material Security and Multilateral Agreements Stephan Klement Office. 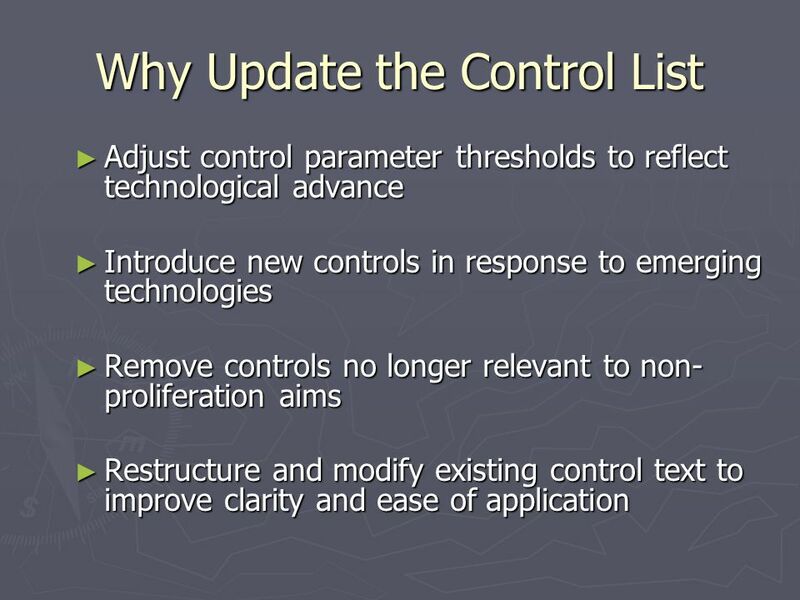 NCL License Processing Overview Bernard Kritzer Director, Office of National Security and Technology Transfer Controls Bureau of Industry and Security. 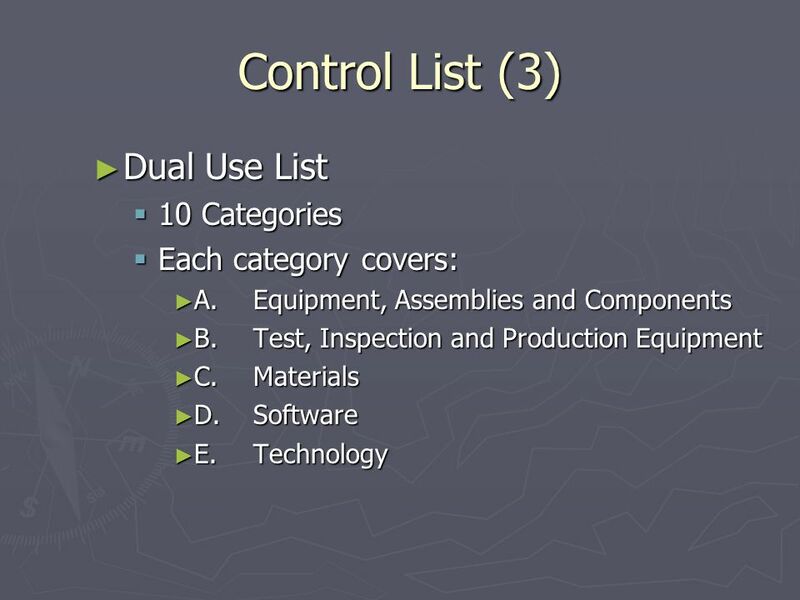 How to Determine If You Need a Commerce Export License Relatively small percentage of total U.S. exports require a Validated License Most products are. 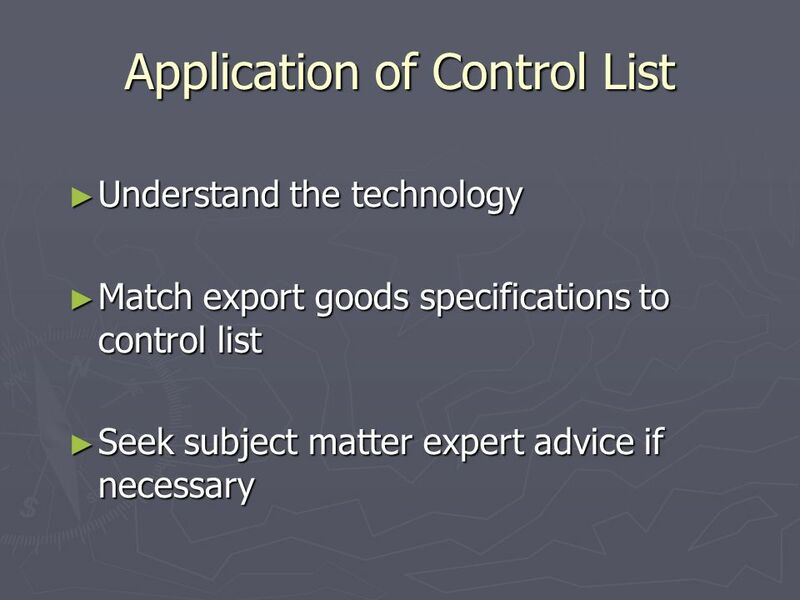 Export Controls: What are they? Portfolio Committee on Trade and Industry Non-Proliferation Council Annual Report 4 June 2008. Proliferation weapons of mass destruction © 2014 wheresjenny.com Proliferation weapons of mass destruction.